WILD – Dazzled by Africa, Inspired to Act. If you were a United Airlines passenger and were greeted by pilots Mike Paredes or Nancy Law, you probably wouldn’t guess that the two have survived multiple, unpredictable encounters with elephants, crocodiles, lions, and buffalo in places such as Mozambique and Zimbabwe. Commercial flying afforded Paredes and Law the opportunity to meet—they were introduced by fellow pilots, and he’d heard about her great parties in Annapolis—but their shared sense of adventure moved their relationship to another level that eventually included marriage. Now they’ve parlayed their wanderlust, poignant sense of what is beautiful, and photography skills into wildlife conservation and humanitarian support, primarily in Zambia in south-central Africa. Lions vs Buffalo. After having to climb a tree to escape the action from a herd of buffalo and a pride of lions in Zimbabwe, Mike shot this photo of the action. Paredes always knew he wanted to travel, and after a brief stint attending a large state university in Florida, he transferred to Embry-Riddle Aeronautical University. Law had worked as a flight attendant, often sitting in the jump seat behind the pilots, and decided she’d rather fly. She learned to do so at Bay Bridge Airport, flying small commuter planes, instructing others, and eventually getting hired by United Airlines. The couple’s shared sense of adventure—from Law’s pre-Paredes, 25-day, 10-country, around-the-world race in a Piper Navajo twin-engine with extra fuel tanks, and Paredes’ desire to record travels and encounters through photography—has always brought them back to Africa and informs and inspires their activism. He upgraded his equipment as finances permitted and began photographing everything from wildlife to people on the streets, whenever he had layovers. 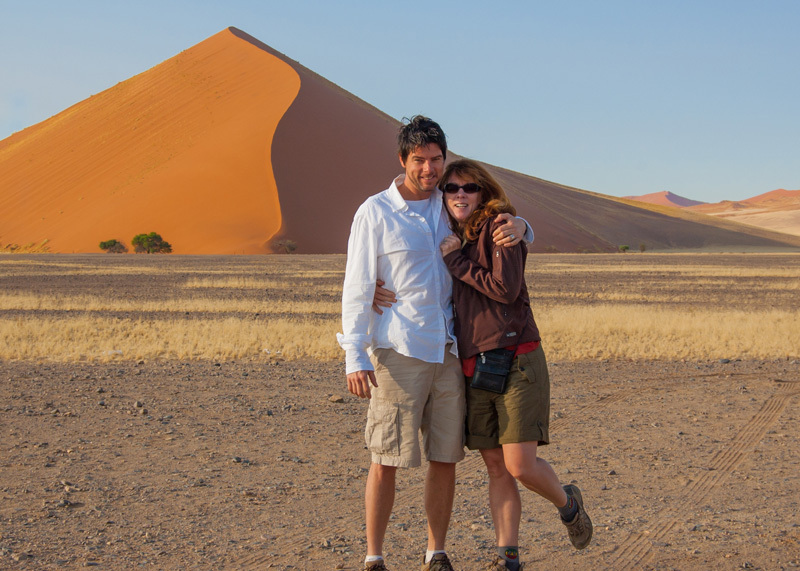 Mike and Nancy at Sossusvlei, Namibia. Two years into their marriage, in 2007, they visited Kenya’s Masai Mara and Lewa Conservancy together, with Law’s best friend and her boyfriend, and had an even deeper experience. “I felt the ancientness of our connection to the continent—the fact that we as a species were born there,” she says. site to benefit conservation of his photograph’s subjects, including elephants and other animals. “That made our work more professional to me, and also gave it some deeper meaning,” he says. He also allows conservation organizations to use his photographs online and in print to support particular campaigns. A wild kudu , photo taken in Zambia by Mike. The trip to Kenya also got them involved in elephant conservation, which included successfully getting a law passed in New Jersey to ban the sale of ivory in the state as well as pushing for legislation in Maryland to stop the sale of ivory and bringing in former safari guides to testify in support of such proposals. China had been the main market for ivory, says Paredes, but its government is now phasing out state-sanctioned markets. In the United States, the struggle is going state-by-state, as it’s unlikely that anything will pass at the federal level at this time. 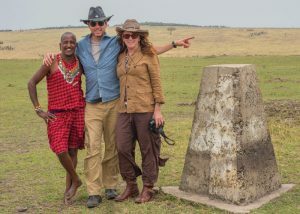 Mike and Nancy pose with safari spotter Sadera at the Tanzania/Kenya border 10 years after their first trip to Africa when he was their spotter back then as well! After their first visit to Zambia, in 2014, Paredes and Law got involved with Dazzle Africa, a Nevada-based nonprofit that supports conservation in Zambia and strengthens the ties between people and wildlife in the country. Today, Paredes is on its board of directors. 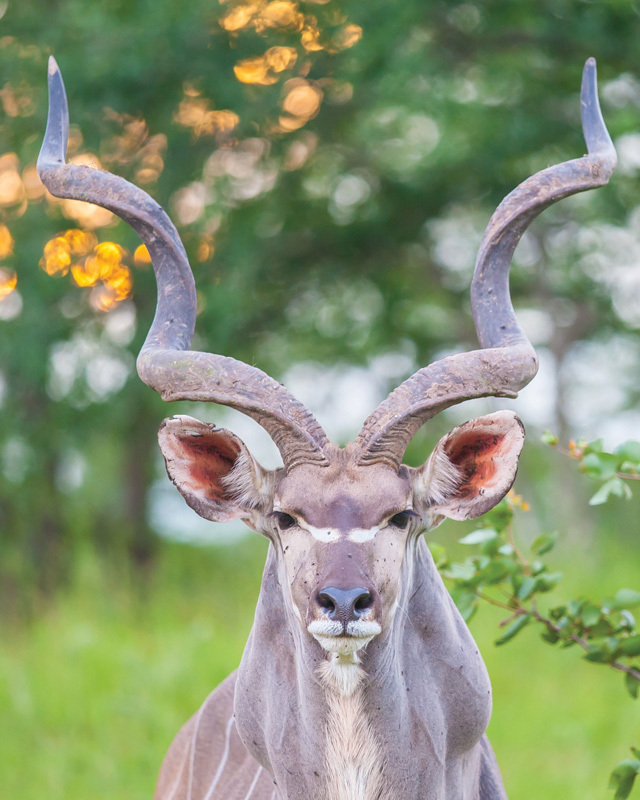 In November 2018, they volunteer-led a second safari to Zambia—the first was in 2016—with a special requirement: each attendee had to fundraise a minimum of $1,000 instead of building in a profit to the safari cost. “They often raise even more,” says Paredes, “so the organization has more funds for the projects.” This spreads awareness about the plight of Zambian wildlife in the safarigoers’ communities. The money from their November safari is dedicated to the operating costs for an anti-poaching plane that patrols around Mfuwe, where South Luangwa National Park is located. Involvement by outsiders in conservation in various countries in Africa tends to be complicated. “One of the things we really believe in and are proud to be volunteering with Dazzle Africa is [the] relationship between the wildlife and the people who live around the wildlife,” Paredes says. “You can’t be the saviors from North America when you’re overstepping your bounds.” Dazzle Africa works in one area and is integrated with the community. The needs are identified, and the people help themselves. “These towns around the national park are directly benefiting from tourism. Local people from those towns are benefiting,” says Paredes. Dazzle Africa also recognizes how important it is to teach people about the value of the animals and sponsors students, even those in college, to return to the community to help. Sometimes safarigoers pay for students’ education or donate the costs of the patrol plane. 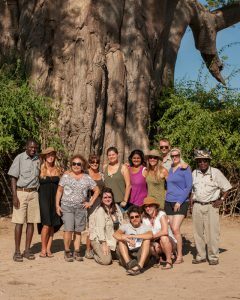 Nonprofit Dazzle Africa philanthropic safari group photo taken in front of giant baobab tree, South Luangwa National Park, Zambia. “We are the guardians of this earth and we are the guardians of these animals, and we have the ability to save them,” Law says. “Our children are our best hope for that. We’re trying to make sure that those children benefit from our coming and will take care of their earth, their animals, and their land. Back home, Annapolis offers something of a vacation for Paredes and Law, as they love to sail. “We have a small sailboat. We kayak on local waters and observe and photograph the amazing wildlife we have here. It’s rare that I don’t have binoculars nearby or Mike is without his camera,” says Law. Paredes also serves on the board of the Annapolis-based nonprofit Future History Now, which helps integrate art into the lives of young people from underserved communities. To learn more about Dazzle Africa and Future History Now, visit dazzleafrica.org and futurehistorynow.org. Mike and Nancy having fun posing in front of an elephant in Zimbabwe. A wild lioness peers out of the bush. 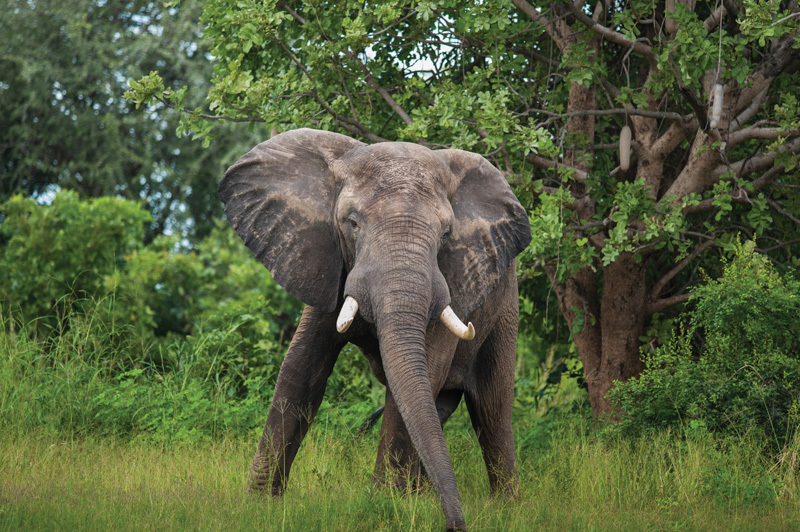 A beautiful wild elephant in Zambia. Leaving our house in Annapolis before heading to Washington Dulles for our first trip flying together, to Madrid. Mike and Nancy photographing very rare wild black rhinos in Zimbabwe. Nancy with a rehabbed orphaned hippo and Nancy on a Dazzle Africa philanthropic safari (they are safari coordinators/leaders at Dazzle Africa and Mike is on board of directors). Mike and Nancy up in a tree in Zimbabwe – They were on a walking safari in Zimbabwe and had to climb a tree to escape some action by a pride of lion and a herd of buffalo. Mike and Nancy at the dam in Zimbabwe. Mike and Nancy are the two people on the left, observing wild African painted dogs in Zimbabwe. Mike and Nancy in Zambia. Mike and Nancy’s first trip to Africa together in Kenya’s Masai Mara, 2007. Nancy and Mike lobbying New Jersey legislature for a bill to ban ivory and other animal body parts from being trafficked. It passed and it was the first victory in the nation. Sadly similar bills in Maryland have failed several times. The photo of the elephant is by famed wildlife photographer Mark Deeble and he had given us permission to use it to lobby for that purpose. It is of the famous elephant bull Satao, who was known to hide his huge tusks from humans by getting behind trees. He knew he was in danger of being poached, and he was, shortly before this photo of us was taken in 2014. Mike and Nancy in Petra, Jordan. Lions vs Buffalo. 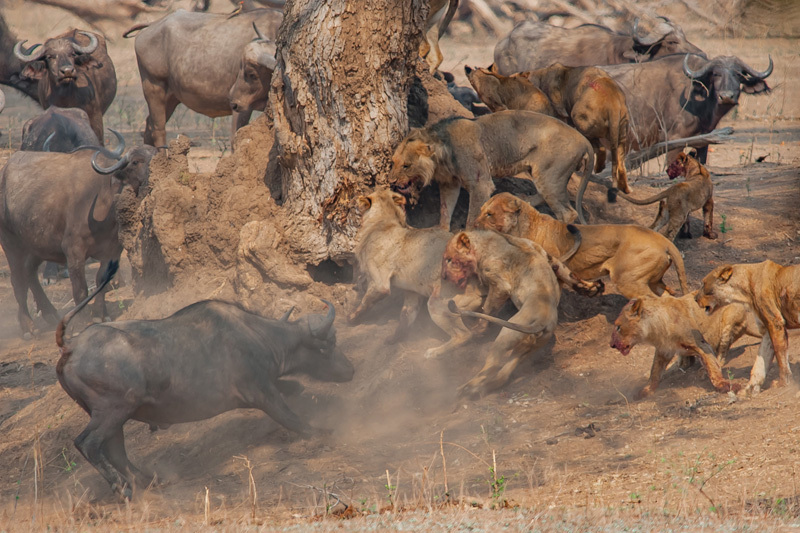 After having to climb a tree to escape the action from a herd of buffalo and a pride of lions in Zimbabwe, Nancy shot this photo of the action. Mike and Nancy in Burma, now known as Myanmar. Mike and Nancy spotting on a trip to Zimbabwe. Mike and Nancy in front of Victoria Falls on a trip to Zimbabwe. Mike and Nancy flying a Boeing 757 together from Washington Dulles to Madrid (first time flying the same plane together). Error: Error validating access token: Session has expired on Saturday, 09-Mar-19 15:57:50 PST. The current time is Friday, 19-Apr-19 11:21:42 PDT.